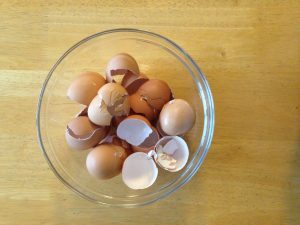 Home » 10 Practical Uses for Eggshells! 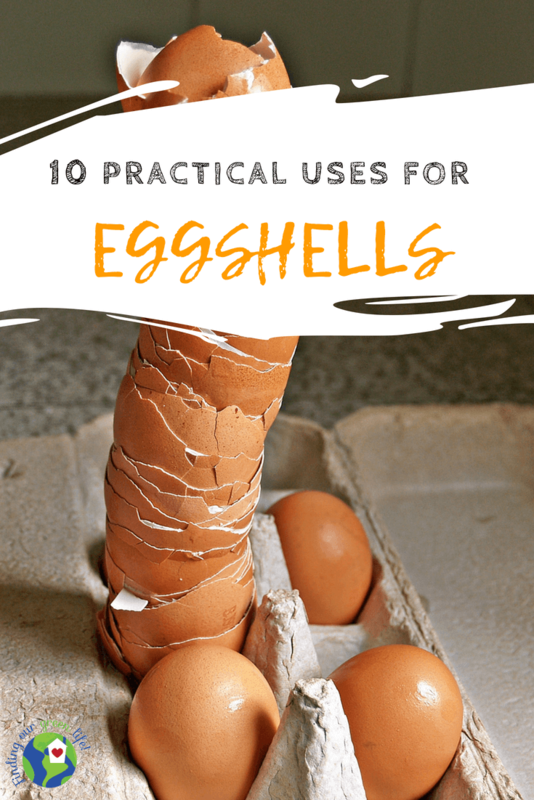 10 Practical Uses for Eggshells! Do you ever find yourself wondering what to do with that pile of leftover eggshells? I’m not talking about the couple left from the scrambled eggs you just made. 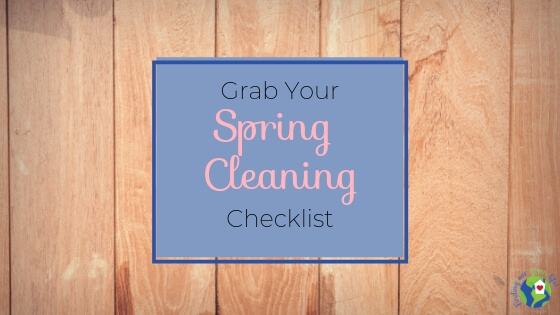 I’m talking about that big breakfast casserole or that time you decided you were finally going to get ahead and make a bunch of grab and go breakfast items for the freezer. Or maybe you’re like me and you read an article about all the different ways eggshells can be used in the garden so you decided to start stockpiling them. Whatever your reason, today we’ll explore 10 different uses for eggshells as well as my personal experiences with a many of them. 1 – Deter Pests – Got slugs or snails? Word on the street is they don’t like the smell of eggs either. For whatever reason, we don’t tend to get slugs or snails in our garden. Now, on my front porch, yes, slugs show up at night and ick but they move on by morning and don’t appear to cause any trouble with my plants. If these pests are driving you wild but you don’t like the look of eggshells littering your garden, grind up the eggshells and sprinkle the powder in. Never hurts to try. 2 – Deer Repellent – Many people claim that deer don’t like the smell of eggs so eggshells provide a natural way to hopefully repel deer. I have spent a few spring seasons working at a plant nursery and an effective deer repellent seems to be elusive unless you put up a fence. Many people are frustrated with the havoc deer can wreak on their gardens but two things I have learned, 1) a hungry deer will eat anything it can get to and 2) always keep in mind, development is forcing deer from their natural habitat, they are just trying to survive. 3 – Seed Starter Pods – Starting plants from seed is not my jam but when I saw this idea, I had to give it a try. 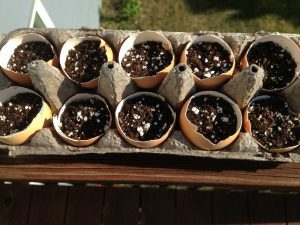 Eggshells are quite sturdy and they usually come in a carton so they make the perfect seed starter pod. Once the seed germinates and starts to outgrow the eggshell, plant it directly into a pot or in the ground because over time, the shell should decompose. I’ve gotten my seeds started but they aren’t yet ready to transfer to the ground. When they are, I’m going to give the shell a slight squeeze to break it up a bit so the roots can more easily expand. Check out Rodale’s Organic Life for a bit more information (from a qualified source) on starting from seeds. I’ve read differing opinions on how fast or slow eggshells decompose but in my experience with my compost bin, they decompose at some point and they provide beneficial calcium to the soil and that ranks high in my book. 4 – Fertilizer – Last summer, blossom end rot was the undoing of my yellow squash and zucchini. The plants were planted in a great spot, I watered them and cared for them, the beautiful squash blossoms bloomed and looked so pretty. My mouth started to water because I knew it wouldn’t be long before I could claim success and then I woke up the next morning. The dream was OVER! I looked out, expecting to see beautiful blossoms and they were brown and DEAD! I was crushed. I was told by several different “in the know” people that it sounded like blossom end rot! They said I should add eggshells to the soil. Apparently, eggshells add calcium to the soil and that can help prevent blossom end rot. I don’t think I’ll be planting squash this year but only because my dog has turned that part of my garden in to a running track and she’ll just trample anything I put in there. That spot also isn’t getting as much sun as when I had originally started it so, I don’t think full sun plants will do well there. Tomatoes can benefit from some added calcium so if you’re planting tomatoes, hit them up with some crushed eggshells. 5 – Feed Birds – Crush up those eggshells and add to them your bird feeder, the birds will thank you for it. Birds need calcium carbonate for their bone health and production of their own eggshells. Strong eggshells go a long way to producing healthy chicks. The ground-up eggshells can be mixed into the wild bird seed before putting it in the birdfeeder, sprinkled on the ground under the birdfeeder or mixed with suet and formed into feeder blocks. For the safety of the birds, please do sterilize the shells beforehand. 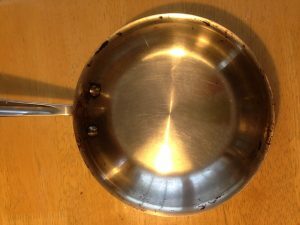 6 – Pot Scrubber – Having a hard time getting burnt on food off your pots and pans? 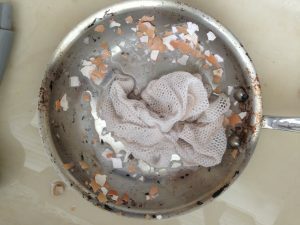 Crush up some eggshells, add a little soap and a little water and scrub away. The crushed eggshells make for a great abrasive. This one surprised me a bit but it did work. I used my Dish Cloth and went to town. It does take a bit of effort and time but it does work. I didn’t finish the job because I ran out of time but you can see how well it did. 7 – Coffee – Does your coffee is a bit bitter? Some say you can grind up eggshells and add them to your coffee grinds before brewing, for a less bitter taste. I tested this theory on my ever so sensitive palate and could not taste a difference. My guess is you’d notice a bitter taste the blacker the coffee is. I am not woman enough to take my coffee black so I add some homemade creamer to it and call it a day. 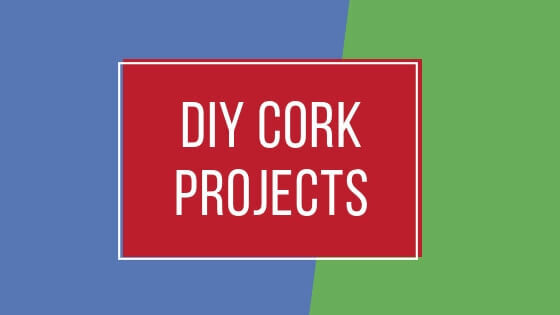 8 – Mineral Supplement – If you’re into DIY, why not make your own calcium supplement? Eggshells are said to be a good source of calcium so why not grind them in to a fine powder and use as a calcium supplement? A few articles I read suggested that 1tsp daily (divided into 3 servings with meals) added to a smoothie or yogurt would be a good way to add calcium to your diet, approximately 800-1000mg. Any more than 1tsp might cause stomach distress. I’m no doctor or expert on vitamins and supplements so it’s best to do your research regarding what supplements should be taken together or separate. If you do try this, please properly prepare the eggshells and make sure they are sterilized first. I’ve never met anyone looking to get salmonella. 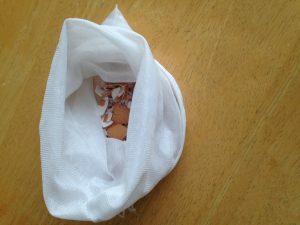 9 – Laundry – Can eggshells really whiten your whites? I’m game for trying things at least once, provided there’s not much chance they’ll kill or maim me. So, I tossed some crushed eggshells into a tight mesh reusable produce bag, tied that and put it in a wider mesh laundry bag and tossed in with my laundry. I was slightly nervous the bag would open and all the shells would come out. Thankfully, that did not happen. Were my whites whiter? It’s hard to say, I didn’t notice much difference. 10 – Garbage Disposal – Who doesn’t have a dirty garbage disposal? Only those without one can raise their hands! Lemons can help freshen it up but eggshells can help clean it. Since I’m sure you don’t want to see the inside of my garbage disposal, you’ll have to take my word for it but I put the shells from 5 eggs in and flipped the switch. It appeared to be cleaner afterward. Give it a go and let me know what you think! Surely, you’ll want to know how this seed starter idea pans out. Progress updates will be posted to Facebook and Instagram if you’d like to follow along and see how things are growing. Whatever you do, I don’t suggest throwing them in your neighbor’s yard. That’s not very polite. Just remember, to make sure they are sterilized if you mix them with birdseed or make into a calcium supplement. I don’t want anyone, animal or person, getting sick. If you try any of these out, let me know how it goes for you and if you have other uses, I’d love to hear those too.